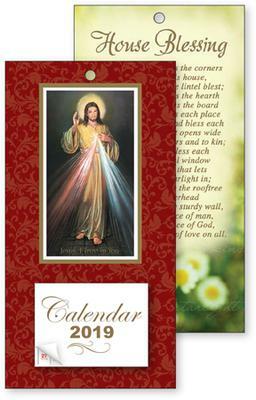 CATHOLIC GIFT SHOP LTD - Divine Mercy Standing Calendar 2019. Divine Mercy Standing Calendar 2019. Divine Mercy standing calendar 2019 this calendar can also be hung. House blessing verse on the reverse. Size: 8" x 4", supplied with envelope.